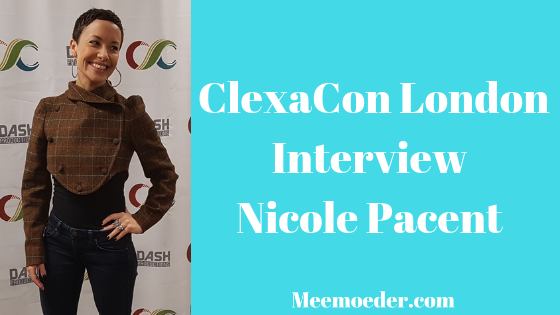 On the final day of ClexaCon London, Nicole Pacent and Mandahla Rose visited the press room together. They are in Passage together, which will come out in 2019. They talked about other projects they have been working on, about queer and non-queer actors playing queer characters, and about mental health. Because the interview was so long, I have divided into two parts. Below, you will find Nicole’s part and here, you will find Mandahla’s part. You can also find a video of the full interview here. Are movies and TV trying to do multiple birds with one stone as in “we now have a queer character who is black and in a wheelchair.” How do we counter this attempt to stack multiple forms of diversity within a single character? Nicole Pacent: That is a great question. I would say that detokenizing all of it is the only way to do that. To say ‘We don’t want the token person of color. We don’t want the token queer person. And we don’t want an X amount of women.’ And I am talking about in front of the camera and behind the camera, right. I think the root of the issue is the fact that people are tokenized so unless we are talking about it those terms regularly and calling that out, then it is not going to change. On your panels, you two did not get the chance to talk much about your upcoming projects. What would you like to say about them now? Nicole Pacent: I have been doing a lot over the past couple of months. So, I have on the podcasting front my Coming-Out Pod with Lauren and Nicole, which comes out weekly on Wednesdays. We interview queer people from all walks of life and tell the tales of how they came out to friends and family and the world at large. See how that rolls off the tongue? I have said it many times. It is the opening of our show. No, it is really wonderful. We have interview Stephanie Beatriz and a bunch of other pretty amazing people. That is on all podcast platforms. I am also on another podcast that is 180 degrees opposite. It is a narrative podcast that just came out from the tech giant SAP. It is Sci-Fi, fantasy, Renaissance nerdy kind of podcast called Searching for Salaì. The podcast is about if Leonardo da Vinci’s assistant Salaì traveled through time and met this one woman. It is about their relationship and trying to debunk his story. There is a whole bunch of nerdy Renaissance and nerdy tech and science stuff in it. And it is just like this beautifully written story and I get to act in it. So, I narrate the entire thing and I am also in all the scenes. That is on the total opposite of the podcasting spectrum but also on all streaming platforms. I shot two short films recently that are both about to do festival runs. One of them is called Other Loving. I play the central character who is a bisexual poly character and who is dealing with a break-up with a boyfriend and having to come home to her wife and talk about that. So, it is stuff people are not seeing, haven’t seen, and are going to feel all different kinds of ways about it, I am sure. It was a really emotional and beautiful project and it has some good people behind it. I also just shot a short film with Melissa Ponzio. She plays my wife in it and that was also a really wonderful and emotional experience. I do not have dates for the release of either of these movies because again it is going to depend on festivals. I just wrapped a musical presentation of a musical called Lesbian Love Octagon, which Mandahla saw. Mandahla Rose: It was pretty fun. Nicole Pacent: It was f*cking great. We may or may not be doing a full run of that in Los Angeles and/or touring it. If we do, I will let everybody know about that. Nicole Pacent, you have said on a panel that you have feelings about how important it is for openly queer actors to be playing queer characters. Would you mind going into that a little bit more? Nicole Pacent: Yes. It is funny; I have not come down on either side of the debate of whether people who are not representative of a certain faction should be playing those characters. We have had that conversation about ethnicity too and it makes a lot of sense that if you are not at least a part of the ethnicity you are playing, that seems wrong to me. I have come down pretty firmly on that side of that debate. I do not think it is that much of a debate anymore. In terms of LGBTQ characters, it is hard. I have two minds about this. As a queer person, I love being able to play queer characters and I love seeing people who are actually queer portraying that experience. Because there is nothing like somebody who knows to be able to do that. And I love the fans’ reaction that I see to queer people playing queer characters. It is really exciting and fulfilling. I think that there is a real power in that that there is not necessarily when heterosexual people play queer characters. So, from an impact standpoint, I think more queer actors playing more queer characters is the way to go. From a purely artistic standpoint, I do like to believe that as actors, our job is to be able to transform and to be able to embody different people and different experiences and that is part of how we gain empathy ourselves and how we also loop maybe those who are more close-minded into things. So, artistically speaking, I am much more open about it but for me, from a business impact standpoint, I do not know. So, those are my two feelings about it. Me: I was at the table reading of Passage. To me, the question is: does the Sci-Fi aspect of it bring more difficulties to shooting it? Nicole Pacent: Well, we are not on the production side of it. It did not make it more difficult for us as actors. Mandahla Rose: No, I got a plasma gun and I was really happy with that. Make sure you follow Nicole and Mandahla on social media! Their handles are @NicolePacent and @TwiistedRose on Twitter and Instagram. PS here are my interviews with Kat Barell, Natasha, Elise & Annie, Jamie Clayton, the team behind I Can’t Think Straight, the writer and producer of Different for Girls, and the directors of ClexaCon.